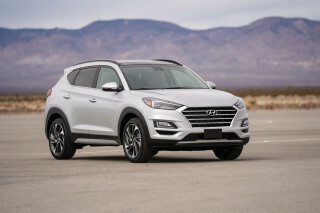 Based on past driving experiences with several Hyundai Tucson models, we recommend that you skip the base four in favor of the bigger 2.4-liter engine. A better ride and improved handling should add to the appeal of the 2014 Hyundai Tucson, which carries forward with curvaceous sheetmetal and against-the-grain crossover styling. Much of the compact crossover class remains influenced by traditional SUV design; but increasingly, models like the 2014 Hyundai Tucson have bucked the rugged pretenses. We think that's a good thing, as it really sets the Tucson apart from other rivals. To put it simply, the Tucson is unabashedly curvaceous. There might be an inch of straight line in its silhouette, the rest given up to surfacing that swells at the fenders and crests at the front and rear. For 2014, Hyundai hasn't made any major changes--which is fine, as the design still looks fresh. LED taillamps and new projector headlamps with LED accents should altogether bring the look a modern edge, even without actual sheetmetal changes, but a panoramic sunroof with roof side rails on some models should cast it in a different, more upscale light. The interior's just a shade less dramatic than the exterior, but it fits right in with the rest of the current Hyundai lineup. The Tucson was well timed and well placed in 2010, when it emerged with a fresh look and fresh running gear; and it remains so for 2014. In fact, Hyundai has given it a pretty substantial mechanical upgrade, with new direct-injection engines as well as new Sachs dual-path dampers. The engines make just a little more torque than those of the same size (2.0-liter and 2.4-liter) last year, and fuel efficiency is up slightly, too. 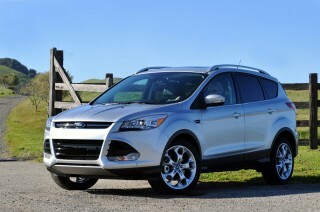 It's still probably wise to stick with the 2.4-liter versions; previous versions were just adequate with the 2.0-liter. In either case, there's no manual; a responsive six-speed automatic makes the shifts. Previous Tucsons tended to ride somewhat harshly, and the new dampers improve comfort without negatively affecting handling. There's a good amount of head and leg room in front. But the seats themselves have good back support, but the bottom cushion is short and tilts down a bit too much; and that can make them uncomfortable on anything more than a short drive. For 2014, Hyundai has added a standard tilt/telescopic steering wheel, as well as steering-wheel audio controls on all, including the base GLS; and cupholder illumination is now included on all models. The rear seat has just enough headroom for taller adults, and good leg room. Given the choice, we'd steer clear of the optional leather seats: the front leather buckets have short bottom cushions that tilt down at their leading edge, leaving them less comfortable than they could be. Safety is sweet and sour. While visibility is actually quite good, and the Tucson checks all the right safety boxes, crash-test results place it squarely mid-pack among compact crossovers. 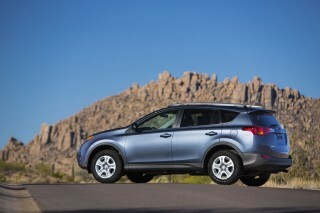 With top performers like the Subaru Forester, its four-star federal scores and 'poor' small overlap frontal results don't approach the top tier--but those are carryover 2013 results and we hope Hyundai can improve them. The Hyundai Tucson made its mark many years ago for offering more features than most other vehicles in its class, for a lot less money. With the current-generation Tucson, it still crams in a lot of value for the money, but it's no longer the feature standout it was. Fortunately Hyundai has so many other positive points now--in styling, for example. The 2014 Hyundai Tucson gets a light retouch, but that's all it needed for its graceful shape. 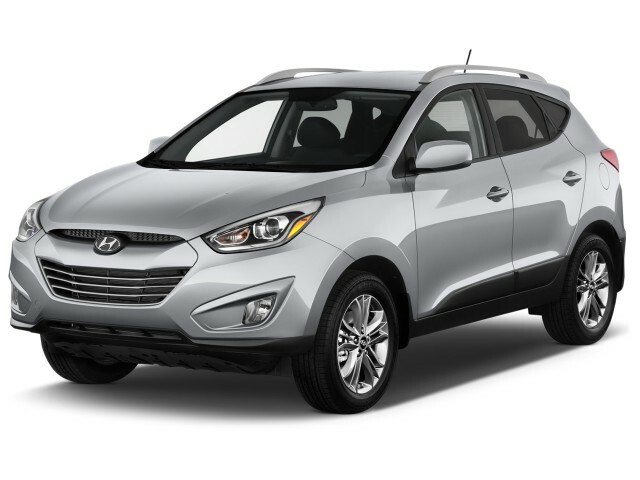 Compact crossover design is still, to some degree, influenced by traditional SUV design; but overall the 2014 Hyundai Tucson manages to eschew that expectation to look rugged and outdoorsy. We think that's a good thing, as it really sets the Tucson apart from other rivals. It's curved, crested, and looks quite upscale from nose to tail, almost like a miniature luxury crossover. It gets a little tall and thick toward the rear--some problems can't be resolved well with arcs of chrome trim, after all--but the angular taillamps drop some of the visual weight out of the rear end. For 2014, Hyundai hasn't made any major changes--which is fine, as the design still looks fresh. LED taillamps and new projector headlamps with LED accents should altogether bring the look a modern edge, even without actual sheetmetal changes, but a panoramic sunroof with roof side rails on some models should cast it in a different, more upscale light. New 17- and 18-inch wheel designs also freshen the appearance. To put it simply, the Tucson is unabashedly curvaceous. There might be an inch of straight line in its silhouette, the rest given up to surfacing that swells at the fenders and crests at the front and rear. Inside, the 2014 Tucson hits the same high note. The interior's just a shade less dramatic than the exterior, but it fits right in with the rest of the current Hyundai lineup. A big LCD screen sits atop the center stack, and vertical blades of metallic trim knifing into bands of tightly grained, low-gloss black plastic. You can do better in this class for fit and finish, but even after the introduction of the latest Ford Escape and Mazda CX-5, the design remains a standout. The Tucson gets new engines for 2014, and handling and ride should involve less compromise. The Hyundai Tucson gets a suite of mid-cycle enhancements for the 2014 model year, and they're due to bring some meaningful improvement to this compact crossover's performance--and that'll hold true whether you most value acceleration, handling, or even fuel efficiency. The Tucson remains about the size of a smaller (albeit quite heavy) compact car, if you go by parking footprint. 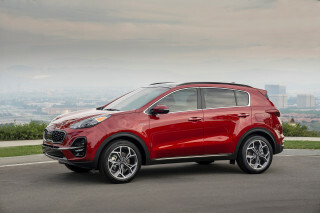 That said, it does just fine with either its four-cylinder engines--although the turbocharged four that highlights the Kia Sportage SX in this class is still missing from the Tucson. And for 2014, the engines are new. 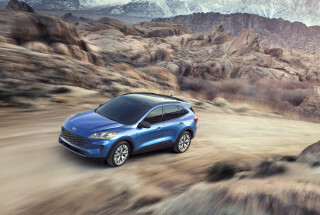 Both the 2.0-liter and 2.4-liter in-line four-cylinder engines get direct injection--which in both cases raises available torque and gives fuel economy a slight boost. The base 2.0-liter engine now makes 164 horsepower (down one from before actually) and 151 pound-feet of torque (up 5); step up to the models with the 2.4-liter, and they now make 182 hp (up 6) and 177 lb-ft (up 9). There's no manual gearbox in the 2014 Tucson; all models come with a six-speed automatic transmission that includes Shiftronic manual controls. And you have a choice between front-wheel drive and all-wheel drive throughout the lineup; that's new for 2014 with the addition of a 2.0-liter GLS AWD. Handling and ride should be quite a bit different in the new 2014 model, which we haven't yet driven at the time of posting. In previous model years, the Tucson rode quite harshly, although it handled reasonably well. This year, the Tucson is getting new standard Sachs amplitude selective dampers that improve ride quality without dulling handling response. We've found the engine-speed-sensitive electric power steering to be a weak spot in some otherwise very pleasant driving dynamics; but with a revamped suspension, we're going to have to get back to you on that--in revised driving impressions to come. 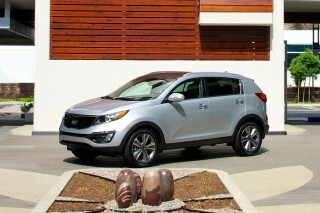 This is one of the smaller compact crossovers, but tere's just enough space for adults in the back seat of the Tucson. The 2014 Hyundai Tucson is about middle of the road in its segment for interior space. 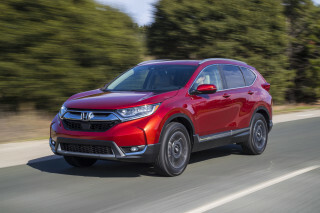 There's a bit more usable room than in the Nissan Rogue or Ford Escape, although definitely not as much as in the Honda CR-V, Toyota RAV4, or Subaru Forester. Yet its long wheelbase gives it a nice ride and, perhaps, the impression of a larger vehicle--especially if you're in the front seats. There's a good amount of head and leg room in front. But the seats themselves have good back support, but the bottom cushion is short and tilts down a bit too much; and that can make them uncomfortable on anything more than a short drive. 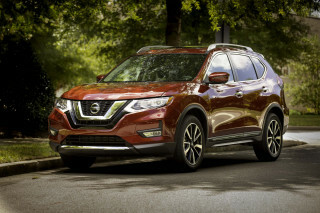 For 2014, Nissan has added a standard tilt/telescopic steering wheel, as well as steering-wheel audio controls on all, including the base GLS; and cupholder illumination is now included on all models. Two adults will fit easily in the Tucson's back seats. We'd recommend the cloth ones over the leather upholstery, which seems to bring a less shapely, more flat seat design. Two-stage recline and 60/40-split seatbacks are now included, so that might aid comfort. There's no space for a third row in the Tucson, but it does have impressive cargo space, considering its very compact exterior. Fold down the seats, and you get the sort of rectangular, wide-open space that's good for pets--or moving small pieces of furniture if you fold the second-row backrests forward. Otherwise, within the cabin there are plenty of smaller storage spaces--with cubbies and bottle holders in the console and door panels, and a deep glove box. The only surprise is that there are so many hard plastics inside; but fit and finish has been good in all the Tucsons we've driven. Look for new interior colors this year to help keep the cabin fresh, too. The 2014 Hyundai Tucson is no high achiever for safety, but all the other indications are good. Overall, the Hyundai Tucson has fared well for safety. Results aren't yet out for the 2014 model, and while there are major powertrain and suspension changes, the structure carries over. So with caution, we recommend that you use last year's safety results as a starting point. Looking at its safety set first; this is a model that covers all the usual bases for safety-conscious shoppers. In addition to all the usual airbags and stability systems, hill descent control is also standard, along with brake assist, tire pressure monitors, and active headrests. A rearview camera is available, and Bluetooth is now standard. And if you do that, the Tucson hasn't done all that well compared to its peers. The insurance industry-funded Insurance Institute for Highway Safety (IIHS) has tested the Tucson in all its categories and given it all 'good' ratings--except for one very noteworthy fail: a 'poor' rating in the important new small overlap frontal test. The National Highway Traffic Safety Administration (NHTSA), otherwise, has renewed the Tucson's overall score of four stars, which includes a four-star score on frontal impact protection and rollover resistance, and a top five-star score in both the side impact and side pole tests. An already solid feature set in the Tucson has been updated for 2014, highlighted by a new navigation system. Standard features for the base Hyundai Tucson include air conditioning, Bluetooth hands-free calling and audio streaming, keyless entry, a USB port, satellite radio, and power windows, locks, and mirrors. 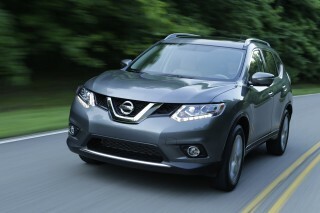 Automatic headlights, fog lights, and heated front seats are also included in the GLS. SE models also now add a rearview camera system and 4.3-inch touch screen. The top Tucson Limited adds leather seating, navigation (a new system with a larger seven-inch touch screen), as well as voice recognition, HD Radio, and the BlueLink suite of services. We're expecting that options will still include leather seating, a power driver seat, and dual-zone automatic climate control--as well as the revised panoramic roof. Gas mileage for the 2014 Hyundai Tucson now lags most other small crossovers--despite new engines this year. The 2014 Hyundai Tucson gets two new engines this year; but sadly, that doesn't significantly improve its EPA fuel economy ratings. The base Tucson is rated by the EPA at 23/29 mpg, for its combination of a 2.0-liter four and a six-speed automatic gearbox. That's only up by 1 mpg in the city, and it keeps the same Combined rating as last year. 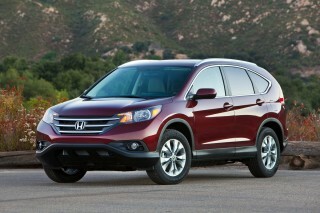 With the larger, more powerful 2.4-liter four-cylinder, ratings go down by one versus the larger engine--to 21/28 mpg. All-wheel-drive models are significantly lower on the highway (25 versus 28 mpg for the larger engine, for instance), so get AWD only if you need it; but we tend to think that the larger 2.4-liter engine is a worthwhile upgrade--and its real-world fuel efficiency may be about the same.